Speedprint Technology will exhibit in booth 622 at the upcoming SMTA International Conference and Expo, scheduled to take place October 16-17, 2012 at the Walt Disney World Dolphin Hotel in Orlando, FL. 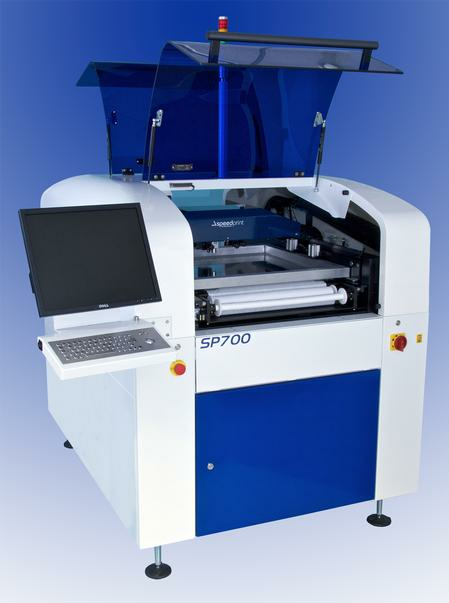 Speedprint prides the SP700avi for low ownership costs, simplicity, ease of maintenance and overall value. The advanced screen printer combines Speedprint’s commitment to high performance and reliability with all the necessary features for processing high technology substrates as standard equipment. The system was designed to cope with the rigors of high-volume SMT production while incorporating the flexibility needed in high-mix, quick product setup and changeover environments. The SP700avi becomes the SP710avi when it is equipped with the Automatic Dispense unit (ADu).The Dual Syringe, Automatic Dispense unit (ADu) allows users to eliminate additional capital outlay by integrating this functionally into the printer. The ADu defines flexibility from its ease of programming through to calibration and cleaning. Utilizing the PCB Gerber file, an operator can simply drag any region of interest to automatically program volume deposits of paste or glue. There is no need to spend time on each deposit site adjusting to optimize the volume, point and drag. This means that a complete PCB can be programmed for a prototype in just seconds. ADu will automatically calibrate the nozzle tip length, eliminating any operator errors. Additionally, the unit can automatically map the height of the substrate, meaning that any substrate warpage is identified and appropriate adjustments are applied to ensure an optimized deposit. With 1 micron solid state linear encoders, SP710avi’s accuracy is second to none. The ADu can be fitted with any combination of paste and glue modules, each one utilizing precision steel augers to provide maximum control and lifespan. For more information about the Speedprint SP700avi or SP710avi Screen Printers, meet up with company representatives at SMTA International or visit the company on the Web atwww.speedprint-tech.com. Speedprint Technology became a division of the Blakell Europlacer Group of companies in September 1998. Following the acquisition and re-establishment of Speedprint, the group formed a new engineering team, many of which had years of experience with locally based printer manufacturers including DEK and SMTech, to develop and enhance the company’s portfolio of products. In keeping with the ethos of the Blakell Group’s desire to offer flexible and innovative solutions to the market, Speedprint is committed to delivering affordable leading edge stencil printing technology. The realization of this ambition is clearly illustrated by the company’s flagship avi range of fully automatic inline printers. Today, Speedprint operates from a hi-tech facility based in Poole, in southern United Kingdom.